Toshiba has reported a record quarterly net profit thanks to the US$18 billion sale of its flash memory chip business earlier this year to a consortium led by U.S. private equity firm Bain Capital. But the conglomerate did not say where its future growth will come from without full ownership of the prized chip business. Its remaining main businesses such as energy and social infrastructure are struggling to fill the void left by the chips unit that accounted for 90 per cent of its operating profit last year. Toshiba posted a net profit of 1.02 trillion yen (US$9.16 billion) for the April-June quarter, up from 50.33 billion yen a year before, as it booked 966 billion yen in gains from the deal to sell the world's no.2 producer of NAND chips. That was above a consensus estimate of 570.29 billion yen from four analysts surveyed by Reuters. Toshiba maintained its profit forecast for the year ending March at 1.07 trillion yen, versus a consensus estimate of 1.11 trillion yen from 12 analysts. The chip unit sale helped save Toshiba from years of financial crisis brought about by accounting scandals and billions of dollars in cost-overruns at its U.S. nuclear unit Westinghouse. Under the deal with the Bain consortium, Toshiba repurchased 40 per cent of the unit. 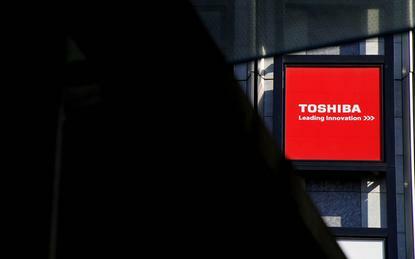 Toshiba had promised to share proceeds from the chip sale, addressing calls for larger returns from activist shareholders who participated in a US$5.4 billion share issue late last year that helped the company to avoid a delisting. Following up on the pledge, the company unveiled a higher-than-expected US$6.3 billion stock buyback in June. As of end-March, more than 70 per cent of Toshiba shareholders were overseas institutions, regarded as more vocal than their Japanese counterparts in making demands of management.